Several small railroads are illustrated - constructed to convey cotton to market. 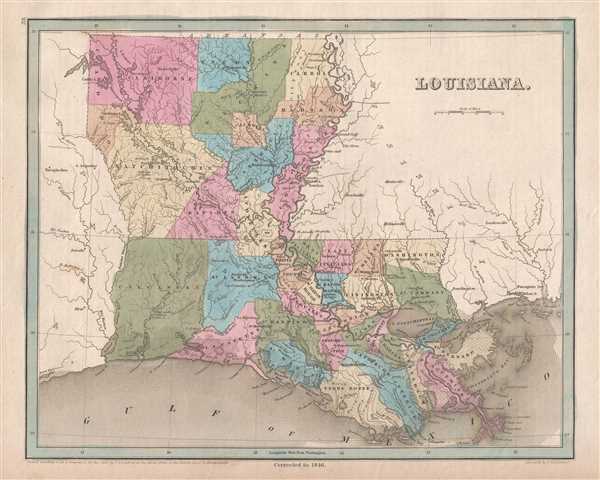 This is an 1846 Thomas G. Bradford map of Louisiana. The map depicts the region from Texas to Mississippi and from Arkansas to the Gulf of Mexico. As is the case with the majority of the maps included in A Universal Illustrated Atlas, the nascent railroad network is illustrated. Several of the railroads illustrated here traveled very short routes; most were less than thirty miles. The Alexandria and Cheneyville Railroad, for example, stretched twenty-eight miles, while the Clinton and Port Hudson Railroad managed thirty miles. The West Feliciana Railroad, between St. Francisville, Louisiana and Woodville, Mississippi, is illustrated here. When it was abandoned in 1978, the twenty-eight-mile line between Bayou Sara and Woodville was the oldest standard-gauge line in the nation. These short railroads were constructed to get cotton, the all-powerful export of the antebellum South, from the plantations and mills to the Mississippi River, and were a welcome (if expensive) alternative to the poorly constructed roads. Highly detailed, each county is illustrated, labeled, and shaded a different color to allow for easy differentiation. Numerous towns and villages are labeled, including Baton Rouge and New Orleans. The mighty Mississippi River winds its way down the map, forming part of the border between Louisiana and Mississippi, along with myriad other rivers and creeks.